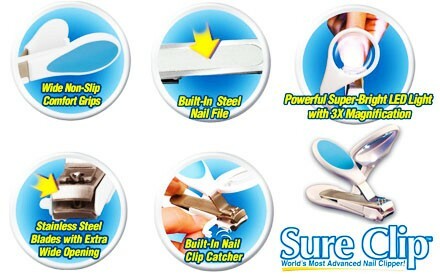 Sure Clip is the world's most advanced nail clipper. The wide, rubberized non-slip comfort grip gives you complete control. The professional quality stainless steel blades give a clean, precise cut every time. With an extra wide opening, Sure Clip even cuts thick, hard nails. There's even a built in diamond-edge steel file, to smooth edges or for quick touch ups. No more flying clips, no more bending to clean up, no more squinting or struggling to see what you're cutting. Sure Clip is nothing like other common nail clippers you’ve ever seen before. You will get totally new experience with Sure Clip. It gives a clean, precise cut every time with the professional quality stainless steel blades. It has wide non-slip comfort grips that give a full control. Even the thick, hard nails are easy job for Sure Clips because they come with an extra wide opening. The Easiest Way to Clip Nails! Sure Clip™ built-in nail catcher empties with ease. The wide, rubberized comfort grips give you better control for precise results. Its powerful, optical quality 3X magnifier with super-bright LED light allows you to clearly see what you're cutting. The extra-wide professional quality steel blades clip even thick, hard nails. It's great for both toenails and fingernails. Clipping your nails shouldn't be a hassle. With the Lighted Magnifying Nail Clipper it isn't!